To be a “Keystone Cop” is an expression still regularly applied to an individual or a group that appears extremely incompetent while exhibiting an uncommon amount of energy in the pursuit of failure. In other words: ineffectiveness on steroids, chaos on wheels. So where did this constabulary idiom come from? Well, Hollywood, of course, a long time ago. Keystone Studios, Edendale, L.A., 1916. With insert of studio head Mack Sennett, (1880 – 1960) who was among the first to bring vaudeville’s slapstick to Hollywood and then expand its scope to breath-taking extremes. 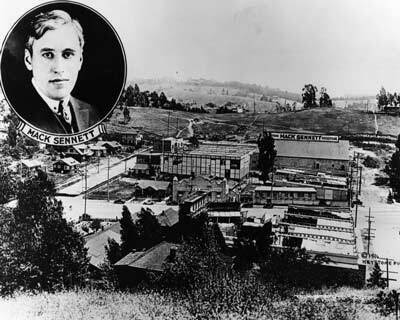 In 1912, Mack Sennett, 37-years-old and already a veteran of New York City’s vaudeville and motion picture scene — actor, singer, dancer, clown, set designer, writer, director — opened Keystone Studios in Los Angeles after obtaining financial backing from East Coast bookies/movie producers Adam Kessel and Charles Bauman. 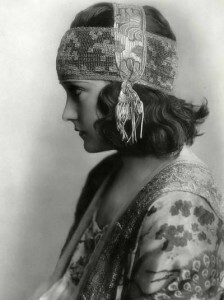 Sennett’s productions helped launch the careers of silent stars including Marie Dressler, Mabel Normand, Roscoe “Fatty” Arbuckle, Charlie Chaplin, and Gloria Swanson. W.C. Fields and Bing Crosby also appeared in Sennett’s later talking and music shorts. Gloria Swanson above, in the 1919 film “Don’t Change Your Husband,” appeared in many early Keystone productions. The actress went on to achieve world-wide acclaim, while also becoming known as the on- and-off-again, not-so-secret mistress of Joseph P. Kennedy, the father of our 35th President, John F. Kennedy. British music hall comedian Charles “Charlie” Chaplin got his start in movies at Mack Sennett’s Keystone Studio. 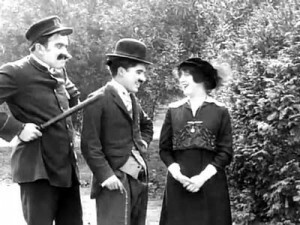 Sennett told Chaplin, “We have no scenario — we get an idea, then follow the natural sequence of events until it leads up to a chase, which is the essence of our comedy.” At Keystone, Chaplin wrote, acted, and directed, as he did in the 1914 film “Getting Acquainted,” above with Mabel Norman. A Keystone Cops chase scene, with speeding cars, roaring trains, a house demolished, and a boxcar of dynamite blown up! Who could ask for anything more? From Footageworld.com. 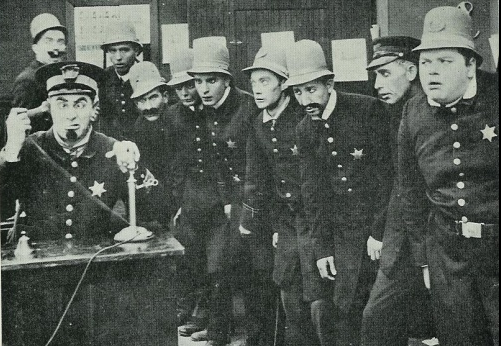 But beyond any single actor, actress, or film, Mack Sennett is most remembered today for the antics of his beloved Keystone Cops, a troupe of officers of the law who appeared numerous times in his films. Their kinetic harebrained antics and seemingly death-defying chases set the standards forever for slapstick comedy and action scenes alike. 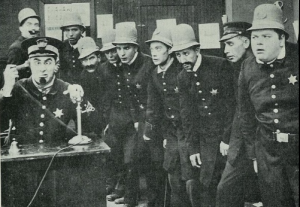 Even today, a century after their introduction, “Keystone Cops” remains a well-known signifier of ineptitude in action. Why? Because the antics of these cops STILL REMAIN FUNNY AFTER ALL THESE YEARS! Side-splittingly so. Perhaps the British comedian, Benny Hill (1924 – 1992), provided the most popular modern homage to Mack Sennett in the ending chase scenes that were always part of his comedy TV shows. These skits were filmed without dialog, and yes, they usually involved young women in swimsuits or miniskirts, or cops … er …”bobbies” (with the female officers always dressed in, you guessed it, miniskirts). Benny Hill, like Bovril, (a gooey meat paste spread on toast) is a British taste. But admit it, if you ever saw “The Benny Hill Show” when it was in syndication in America in the 80’s, you laughed. A lot. And who hasn’t forgotten “Yakety Sax,” burned in one’s memory forever, which served as background music for his chase skits. This entry was posted on Thursday, October 29th, 2015 at 7:02 pmand is filed under . You can follow any responses to this entry through the RSS 2.0 feed. You can leave a response, or trackback from your own site.